How to convert EPS to DXF in batch? 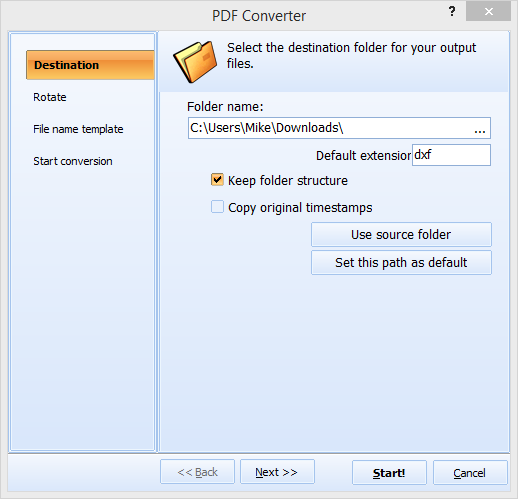 You are here: CoolUtils > Total PDF to DXF Converter > How to convert EPS to DXF in batch? EPS, also known as Encapsulated PostScript File, is an updated version of PS, PostScript format and it may contain 2D vector graphics, bitmap images, and even text. Also, EPS files might contain embedded preview image in bitmap format and might be placed within another PostScript document. Unlike PS format, EPS files can be easily viewed in a wide variety of applications: Adobe Illustrator CS5, CorelDRAW Graphics Suite X5, Corel PaintShop Pro X4, Adobe Acrobat X, Microsoft Word 2010, ACD Systems Canvas 12, Corel WordPerfect Office X5, QuarkXPress, Grasshopper PageStream, Scribus, MAGIX Xara Designer Pro, and Design Science MathType. However, if you want to export EPS into DXF, a Drawing Exchange Format, you should consider downloading Total PDF to DXF Converter by CoolUtils. This program allows you to easily convert PDF, PS, EPS, EPI and PRN to DXF into DFX, SVG, CGM, and HPG without AutoCAD. Converting EPS to DXF has never been easier! Launch the program via the command line (for experienced users only), Start menu or desktop icon. The conversion process is guaranteed to take only a few minutes depending on the amount of files you are processing! Download your free trial version of Total PDF to DXF Converter now and use it for 30 days to evaluate the quality of the converter! 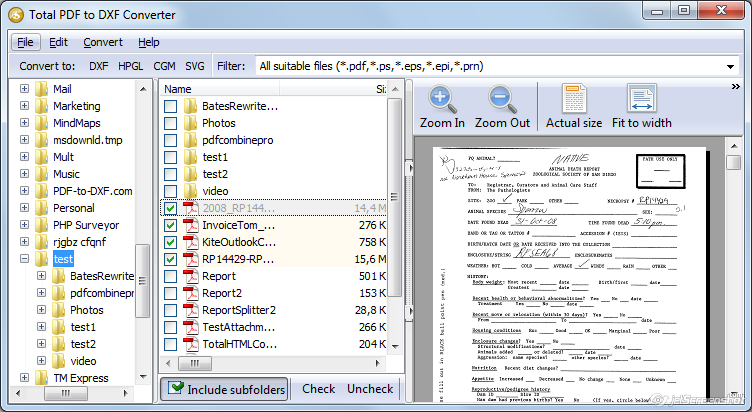 Or buy your personal license for just under $125 and use Total PDF to DXF Converter forever! Free updates and maintenance are offered for 1 year! Contact CoolUtils customer support team 24/7 to learn more about Total PDF to DXF Converter and other programs.